Urinary catheterisation is a common clinical procedure. While there are some benefits of catheters, there is a risk that a patient may get a urinary tract infection because of the device. Catheter associated urinary tract infections (CAUTIs) have a significant burden on the health system. Those affected by a CAUTI are likely to have a hospital stay that is at least twice as long1,2, and costs twice as much3 than those without a CAUTI. A patient with a CAUTI is also more likely to acquire drug-resistant infections which may need treatment with more complex antimicrobial therapy4. The CAUTI Improvement Project was launched in 2016 to help health workers in reducing the number of CAUTIs in acute care settings. 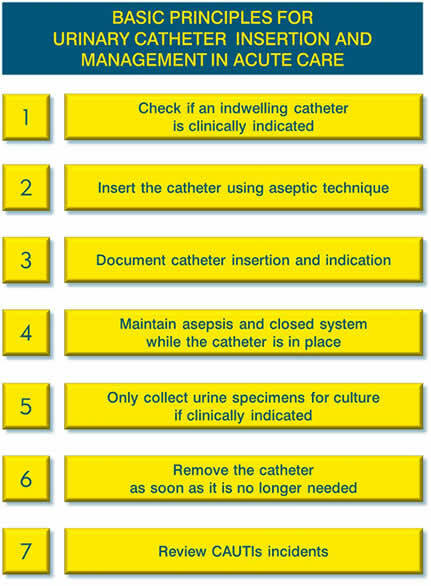 It is based on the basic principles for catheter insertion and management (see above) and provides decision support tools, clinician education, patient information, investigation tools, and promotional materials to promote better clinical practices. Looking for evidence to support your local project work? Need to convince colleagues about the importance of CAUTIs reduction? The CEC has compiled a list of relevant literature to assist in garnering support for local projects. Daniels, K.R., G.C. Lee, and C.R. Frei, Trends in catheter-associated urinary tract infections among a national cohort of hospitalized adults, 2001-2010. American Journal of Infection Control, 2014. 42: p. 17-22. Jackson, T.J., et al., Marginal costs of hospital acquired conditions: information for priority setting for patient safety programs and research. Journal of Health Services Research and Policy, 2011. 16(3): p. 141-146. Chenoweth, C.E., C.V. Gould, and S. Saint, Diagnosis, management, and prevention of catheter-associated urinary tract infections. Infect Dis Clin N Am, 2014. 28(1): p. 105-119.